Computers seem to be an unavoidable part of life for many of us. Many of our patients spend the day working at a computer, and many go home only to…check their email, log in to Facebook, or browse the web. It is surprising how many patients use their distance glasses (or no glasses!) while they are viewing their computer screen. This is not a big deal if you are viewing a computer monitor for just a few minutes, but if you’re working at a job that requires prolonged viewing of 15 minutes or more, you are likely asking for problems with eyestrain. Red eyes, tired eyes, irritated eyes, dry eyes, eye fatigue…the list goes on! There are many great lens solutions for folks that spend lots of time at their computer station, and actually computer lenses are really easy to learn how to use properly. Vista Eye Care, in Thornton, Colorado, is here to help our patients see great and see comfortably with the latest lens technologies. We help people in Brighton, Westminster, Northglenn, and Thornton see great and keep their eyes health. The trial frame isn’t much to look at (it isn’t too comfortable either!) but it helps our doctors determine the perfect prescription for use at your computer. The key to relieving eyestrain is to first understand how the eye focuses. When you are wearing your distance glasses (or not wearing glasses if your distance vision doesn’t require lens correction), your distance vision is clear and your eyes are relaxed when viewing a far-away object. In this scenario, your eye would need to focus to see objects up close (including computer screens) and that process of focusing requires constant action by the eye muscles. This focusing can be provided by either the patient’s own eye muscles (which are prone to fatigue) or a lens (which doesn’t get tired at the end of the day!). There are two main arrangements of ophthalmic lenses that can relieve computer vision syndrome-included eyestrain: Office lenses and single vision lenses. Both versions are computer glasses that can help make you see and feel better when working at a computer. Single vision lenses are determined by careful trial framing in the exam room. Dr. Abert or Dr. Pedroza will take a good guess at what your appropriate computer power might be and they place that power in the trial frames for you to try (see illustration of a trial frame). 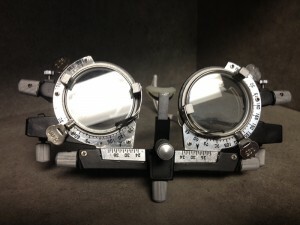 The trial frame is not comfortable, and looks like something out a cheesy 50’s sci-fi movie, but it serves its purpose and gives patient and doctor a preview of what the vision correction needs to be. Once you are wearing the trial frames and sitting at a computer, your eye doctor will refine that initial power estimate and come up with a finalized power for each eye that leaves the screen nice and clear and your eye muscles relaxed. Office lenses take this concept one step further and introduce an extra portion of power at the bottom of the lens to help with focusing on up close (i.e., reading and phone) objects. The closer an object is, the more focusing power (or lens power) that will be required to see it clearly. Reading is usually done at a distance a bit closer than computer viewing so it will thus require a bit more power. To keep the eyes completely relaxed during your work day, Office lenses include a portion of lens space for focusing the computer screen, and the bottom portion with extra focusing power for reading. Using these lenses is very natural and essentially eliminates eyestrain. But while single vision and Office lenses solve your problems with computer and reading-related eyestrain, they don’t help at all with distance viewing. Progressive lenses, such as Shamir’s Autograph II design, are lenses that allow for viewing at all distances including reading, computer, and distance (such as watching TV or driving). Unlike single vision computer and Office lenses, progressives allow the patient to see at any distance they like because it is a general use lens. A progressive lens will allow you to view your computer comfortably, though you will have a smaller area in the lens in which the computer is clear than compared to an Office lens. An Office lens is a specialty lens designed for use in an office environment and thus is best suited to use at a computer. For patients that spend longer than a couple of hours a day at a computer screen, it is probably best that they have a pair of glasses exclusively for computer use (such as the Office design) and a pair for general use (such as progressives). Figuring all this out is part of your yearly eye exam (glasses exam). Eyestrain doesn’t have to ruin your day. While spending the day focusing on a screen probably won’t cause any long-term damage to your eyes, no one wants to go home with tired, aching, red eyes. Taking advantage of modern lens technologies is a simple solution to the problem. Call Vista Eye Care to schedule your yearly eye and vision examination and let our optometrists help you with your vision needs!